Discussion in 'Fallout Tactics Modding' started by Melindil, May 15, 2018. Dialog scripting is on my to-do list, but it's pretty far down the list. Not because it isn't useful or cool, but because I know I need a lot more experience with FoT internals before trying to tackle it. 1) The Lua scripting language used in the extender could certainly run the dialog processing, so all of that could be done outside of hex editing (far easier). It might be good to have a sample model/implementation of a game with a decent moddable dialog tree system already, mainly for ideas on what pieces are necessary. 2) The dialog engine needs the ability to set and check mission and campaign variables, for cross functionality between the built-in FoT scripting behaviors and that driven from the extender's Lua scripts. This is much higher on my to-do list, and given my investigation in other areas, I don't expect too much trouble here. 3) The UI is likely to be the hardest part. Best-case (effort-wise at least) is if there's an existing UI window that's close enough to a working dialog interface that only minimal change is necessary (maybe adding a text box to the existing conversation UI window for showing the player's dialog options could work). If not, it may involve coding a window interface in the extender DLL, either using the individual FoT UI controls, or by calling DirectDraw functions directly. This is much harder, but could be a bit more customizable. I'm not getting a lot of time to work on things lately (baby care ), but I'm fairly close to having a first release ready. Capabilities will be mostly limited to those I've shown in other posts already, but a couple of things have been added to give a little more flexibility (mainly visibility to the game timers, and functions to adjust both permanent and temporary attribute modifiers). Great news! As long as it does happen I can certainly wait for it!! Text box to existing conversation UI window sounds both the best case and the desirable one(understandable). *BTW... WTH happened to the Wilma character in FO:Tactics? 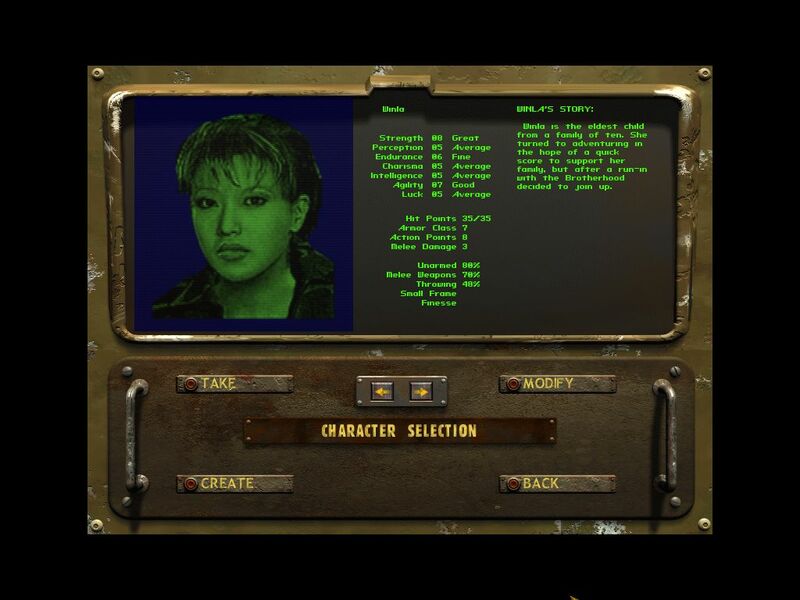 When I load old save games it shows the correct photo in the game thumbnail, but in game, it substitutes a new character called Wilna, with a different portrait. ???? The Wilma PC is no longer an option. Is this the unadvertised side effect of a mod? Looks like something a mod would do. The pic you display is a new one with different background and suffice to say they had limited resources for new char portraits(mainly the workers in Microforte I think) back then. Do you have Redux? It changes so many things it might be a candidate for this. That's probably it; but I certainly don't remember installing a Tactics mod. This is clearly a mod's work, probably one replacing some core files. If this is the case (and not an extra folder from which your game starts), you can go to CORE/Gui/char to replace CORE_prefab5.zar to its original (attached), and also the one in /Big folder. Use the .zip I sent you, that will be easier. OH... I remember I promised you (Melindil) an in-game statue for having solved the mystery of the full-colour portraits an here it is! I made it a long while ago but forgot to show it to you all. I can also add you as a game character if you want in the future, if you want to send me a picture of you by mail (hugo@hugonadeau.com). Ha! I don't have a picture that I'd like to use .. but I could picture Melindil as a steampunk-style engineer (or something similar that fits the setting). This mission uses the mission map "Peoria", mostly divided into four parts : Outside (peacefull village), inside (scientific research center and home for the inhabitants during winter), inside after the first turrets (Humanity Archives) and restricted zone (Humanity (Military) Archives). I imagine your character Melindil to have founded the hacker village of Kofun (the name comes from the first use of the bunker as a tomb) and then simply continued his exploration of the bunker. When he got to the last part, the internal system activated the turrents when he got inside an he could just not go out of the restricted zone (too deadly) and finally stayed in that small appartment for 10 years. Exploring the bunker will give the chance for the player to liberate Melindil from his "tomb". - Defaut pale green color used to identify characters and entities on the ground. Impossible to set using text codes like <Cw> as character names don't accept the codes. They display the code instead of the right color. - Background color of the tip boxes. Black by default. As soon as you use a dark default font color, all help popup information boxes get almost invisible, including the needed item name when bartering. A way to define that box to white would be great.